Many of us women obsess about our nails. Caring for them with nail and cuticle cream, regular manicures, painting them with the season’s colours and visiting nail spas to get pretty art done- is something we indulge in at one point or another. But despite all of this care, sometimes the nail starts showing horizontal ridges that mar the beauty of your well maintained nails. These lines are called Beau’s Lines. Beau’s Lines are horizontal ridges or indentations that happen in your nails, running parallel to the nail bed which the moon shaped white portion of the nail at its origin. It primarily occurs when the growth of the nail slows down due to metabolic issues or there is a disorder in the nail matrix. The symptom is the occurrence of the line itself on fingernails and toenails. The ridges start occurring over a small area and then go on to cover the entire nail plate. What starts out as a minor line or dent may turn into a more visible depression and can sometimes be affecting all of your nails. 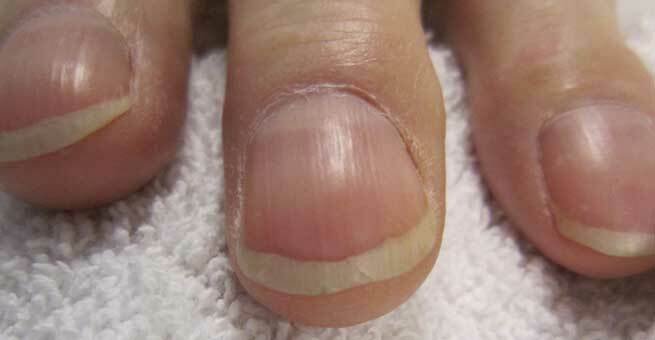 If these lines occur in a single nail, then the cause can be attributed to a local trauma that has affected the nail matrix. You might have bumped your nail against something hard or the nail would have jammed between a door and that would cause a ridge to appear. In situations like these, Beau’s lines start appearing because the nail stops producing newer cells on a daily basis as a result of the injury. It can also be due to extremely cold weather or fever. In such cases, from the Beau’s line it is possible to measure the time since new nail cells were not produced. The nail grows at the rate of 0.1 mm per day. Depending on how far the Beau’s line is from the cuticle, it is possible to calculate the number of days since new nail cells was produced. Zinc deficiency can also cause Beau’s Lines. However, if they occur in all your nails, do not brush it out as something that can be covered with nail polish or try to heal it using nail cream. This is because, ridges along all the nails points to some systemic disorder like heart trouble, measles, extreme fevers or side effect to some drug. If you start getting Beau’s lines, wait a while to see if it is localised. If it is localised and due to some injury that you are aware of, wait until the pain subsides and then think of getting a nail enhancement done to cover up the line until it grows out. Paint your nails in a bright colour to camouflage the imperfection. If the symptom is occurring in all your nails, then do not head to the nail parlour, but to the doctor. Get yourself thoroughly checked for any internal disorders or for it being the side effect of any medication that you are under.